Two well-known Des Moines remodelers decide to form a new partnership. New opportunities often fall into place at the beginning of a new year. 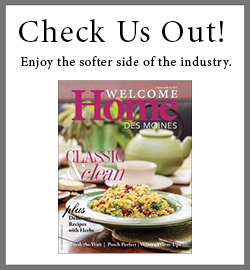 Just ask Zak Fleming and Marc Black, two well-known remodelers in the Des Moines market. Fleming formed his business in 2001, and Black has been the general manager of Silent Rivers Design + Build for 7½ years. The two are forming a new partnership, Fleming Construction LLC, in their service to central Iowa homeowners. Both have been chairs of the Remodelers Council of Greater Des Moines and have earned Certified Graduate Remodeler (CGR) designations from the National Association of Home Builders (NAHB). Both were honored nationally by Professional Remodeler magazine as 40 Under 40 remodelers to watch. Black also holds COSC (Center for Sustainable Communities) Certification, as well as the designation of Certified Aging-in-Place Specialist (CAPS). “We have been good friends for several years,” Fleming says. “Marc is the most sought-after general manager. We have talked a lot about working together. I always said that I didn’t want to offer him a job. I wanted it to be a partnership.” The seed was planted, he says, and over time, forming a partnership became a serious talking point for the two. Fleming says that Chaden Halfhill, owner of Silent Rivers, understands that the new agreement is good for Black, even though he loses his general manager. “Chaden understands that Marc can now be a part owner, and that’s a good thing,” Fleming points out. The two hope to grow the company to about twice as big as it is now, but they want a slow, controlled growth. Along with national trends, the central Iowa market is seeing high remodeling activity. “New construction continues to be strong,” Fleming explains, “but in remodeling, we’re seeing a 30 percent increase in spending.” Homeowners are spending more and seeking more-elaborate outcomes for their projects. Fleming Construction focuses on kitchens, baths, and basements. Fleming Construction has seven on staff and ultimately may be hiring more carpenters with varied skill sets. “We will need project managers and skilled trim carpenters,” Black says. The Joint Center for Housing Studies of Harvard University projects that in the next year homeowners will spend more than $330 billion on remodeling services, from upgrades to replacements to routine maintenance. Part of that, Fleming says, is that many homeowners choose to stay in their existing homes and remodel rather than build or move. The Leading Indicator of Remodeling Activity (LIRA) projects that gains in renovation and repair spending will increase from 6.3 percent in the fourth quarter of 2017 to 7.7 percent by the third quarter of 2018.